Easter bouquets of congratulations were hurled at the Walkerville school board, Principal Hugh Beaton and all those connected with the erection of the new King Edward School when this new educational edifice was formally thrown open to the public Wednesday night. The assembly room was packed and the crowd overflowed the corridors. The gathering included little children all dressed in their best bib and tucker. Their smiling faces were a sufficient reward alone to the school trustees who worked so faithfully to attain fruition of a long cherished ambition and fond parents who will meet the expenses with increased taxation. "It is a little bit different from the old frame school house that I attended when I was a boy," remarked a father, "but nothing is too good for our boys and girls." 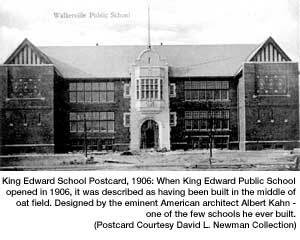 King Edward School was literally on the edge of town when it opened. Standing in the centre of the girls' grass-covered playground, a person could look westward beyond the oat fields and vineyards and the few new homes on Lincoln Road and make out the recently built homes on Langlois Avenue, the last street in Windsor. To the south no streets or buildings could be seen. Looking across unpaved Niagara Street, one had a fine view of the new Edward Chandler Walker estate, Willistead Manor. Scores of trees, some 40 feet tall, had been shipped in from as far away as the Carolinas. No fence obstructed the view of the newly finished buildings designed by Albert Kahn, also architect of King Edward. In the early 1990's, concern that King Edward was aging prompted renovation and then demolition schemes. The Albert Kahn office in Detroit was contacted to check blueprints of the school to verify building materials used in construction. Copies of these plans, however, could not be located due to confusion over the school's name and location. Kahn's office only had plans for a Walkerville High School on Victoria Road, as well as plans for a Victoria Public School, but nothing for a King Edward School located on Chilver Road. Steven Marshall, owner/operator of NeoArch, a building design firm based in Walkerville, has long had an avid interest and knowledge of Albert Kahn's designs and works. Since there was no high school on Victoria Avenue, and Marshall knew Kahn did not design Victoria Public School, Marshall ventured to the Kahn office in Detroit to investigate. Knowing Chilver Rd. was once called Victoria, Marshall discovered the blueprints presumed to be for the two aforementioned schools, were in fact, all for King Edward. He also discovered the structure was constructed of load bearing masonry- not wood- the strongest argument used by proponents of the school's demolition. Marshall also ascertained that the structure was solid and well-built- a prime candidate for renovation, not demolition. Hoping to save the historic Kahn structure and push for renovations instead of destruction, Marshall became an advocate for preservation, drawing support from local architect Roc LeBlanc, and School Trustee Gail Simko-Hatfield. Sadly, their efforts fell on deaf ears, and all that remains of the original school is part of the front façade, incorporated into the new building. Ironically, the new King Edward School cost nearly double the renovation estimate (and probably more since the blueprints indicated the original structure was renovatable). The new school is larger than the original structure and sits closer to Niagara Street. The south playground used for kindergarten and day care children is extremely small. A parking lot was incorporated into the former south playground and has proven inadequate as well. Classrooms are smaller and the new cafeteria is not large enough to accommodate all the students. And, five years after the school's construction, one must, take care not to slip, as the roof tends to leak! Albert Kahn must be rolling in his grave!